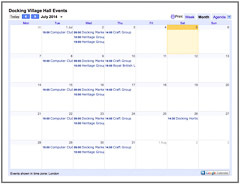 Below are links to external websites that might be of interest - either regular users of Docking Village Hall or connected to the Docking Village. Click on the thumbnail image to the left in each section to open a new browser window. Docking Parish Council website, created to connect with the people living and working in Docking. You can read more about what the council does here and you can leave a response on most pages to let the council know your views on the particular subject. Docking Heritage Group website, a group whose aim is to research, record and present the history of Docking in a way that encourages others to take an interest in and appreciate their local heritage. The website explains the history of the village and established local families, and has many old photos and newspaper articles. Docking Primary School and Nursery website, with information on this small, popular school in the village which takes children from the age of 3 and feeds on to Smithdon High School in Hunstanton. The school enjoys an excellent relationship with the local community and is Ofsted graded as a good school with outstanding pupil behaviour. St Mary, Docking as featured on the Norfolk Churches website, with description, pictures and information on this mid-15th century church. Docking is the highest village above sea level in Norfolk, so standing on the top of the church tower would make you the highest person in Norfolk.